These Trees are from sixteen to twenty Feet in Height, with a Trunc seldom above five Inches thick, the Bark of which is white, the Wood soft and spongy, the Leaves are usually thirty Inches in Length, and about five broad at the widest Part, they grow in horizontal Circles, representing somewhat the Appearance of an Umbrella. 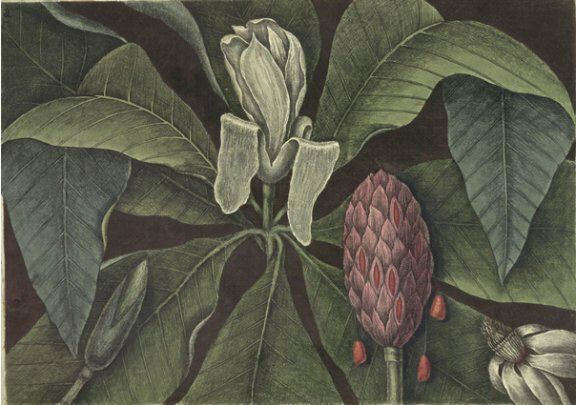 From the middle of one of there Circles of Leaves rises the Flower, which is white, composed of ten or eleven Petals, the three outermost of which are of a pale Green, and before the Blossom opens, encloses the rest of the Petals, and when the Flower is full blown, they hang in the Manner here represented. The Structure of the Ovarium, Seed Vessel, &c. so nearly resembles those Parts of the Magnolia altissima, that I conceive the Figures as they are here exhibited, without any farther Description, will give a sufficient Idea of them. In Virginia I have never seen above two or three of there Trees, which grow at one Place; in Carolina they are more frequent, and grow in rich Land. They drop their Leaves at the Approach of Winter.